I like the lighting on this photograph. Tanya, I wonder if the container is used to crush herbs? Thanks for your comment! To be perfectly honest.. I don't know what the little container is used for. But I will ask around, someone is bound to know. That was set up in a house as a display, it did look really old in person too! Black and white works well in this image. 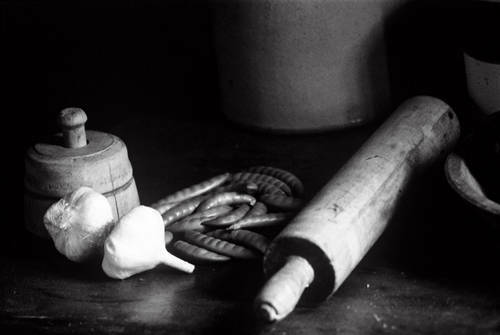 It makes the rolling pin and the wooden container look really old. What is that container used for anyway? It looks like it might be used to crush food or something?